Brunch is one of my favorite things in the world. I love that it's technically a late breakfast, and that's up my alley. I tend to wake up and only want coffee in the morning, and eventually get to food but I usually do oatmeal, yogurt & granola, or cereal. But it weren't just me and Jonah in the morning, Brunch would be happening every day! This week we had some friends over for brunch, and everything was delicious and looked great, and best part...it was stress free. 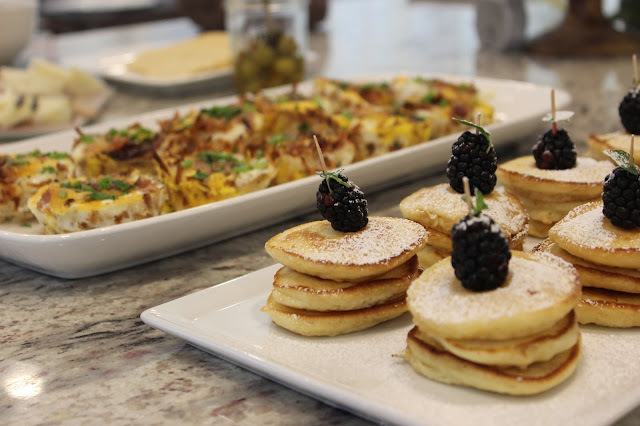 So today I wanted to share 5 brunch tips if you're going to host brunch at your place! I love brunch because there aren't real rules to what you can serve. 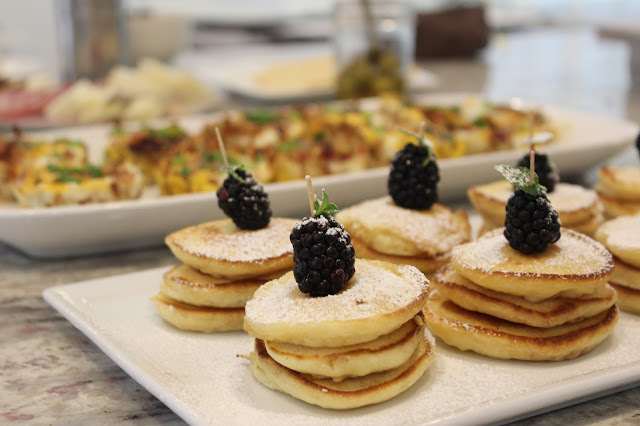 Brunch allows you to serve savory or sweet as main entrees, and cocktails are okay so early in the day. An egg dish as the focal point is a good idea, and something sweeter as another dish is a must. I would definitely do a specialty drink like a mimosa, and a sparkling blood orange juice for those not drinking. And I would skip the dessert, and add some fresh fruit as another side and you're set for brunch! It's okay to start cooking your bacon the day before if it's just going to be cut up and be used in a casserole. Or to cut all your fruit for a fresh salad for the next day. I say prep as much as you can so all you have to do is pop a few things in the oven. I would even set the table the day before if you can too. I managed to go to church in the morning, come home and still have brunch ready without breaking a sweat. I made hash brown egg nest the other day when our friends come over. They were a big hit and seemed a lot fancier than it was. I basically got a muffin tin, and filled an outside layer of hash brown, and filled it with an egg and all it's yummy omelet fillings, and let it bake. They came out looking so pretty and I just garnished with parsley and chives. Making things you don't have to stress about is key. 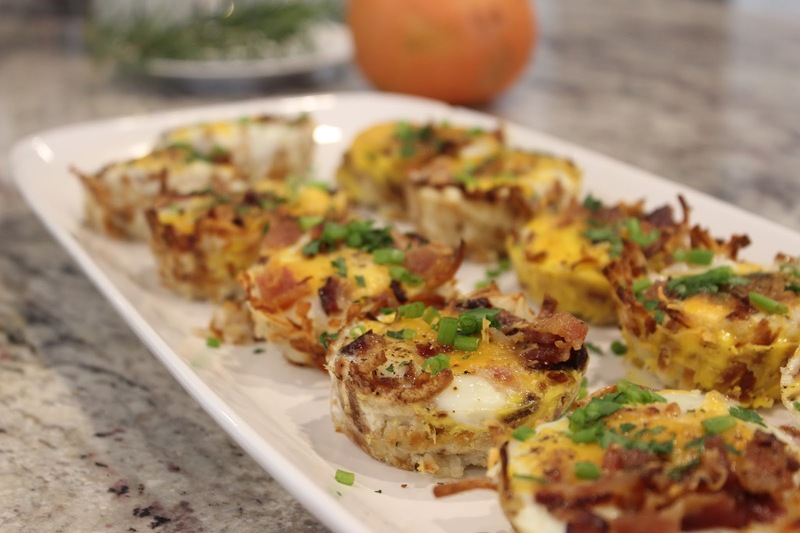 A quiche, a breakfast casserole, a frittata, or these nest is the way to go! Make it easy for yourself! ...go mini! I love the idea of pancakes for brunch, but flipping pancakes can take a while. So I went small with these pancakes. Why? Because they cook so fast, and you can do multiples at a time. I just stacked them and they looked darling. I toped them with some blackberries and powdered sugar and they looked so cute and fancy. And honesty, it took me 10 minutes to make on the stove! That's what I'm talking about! Fresh flowers on a table or even place cards are totally acceptable for brunch. 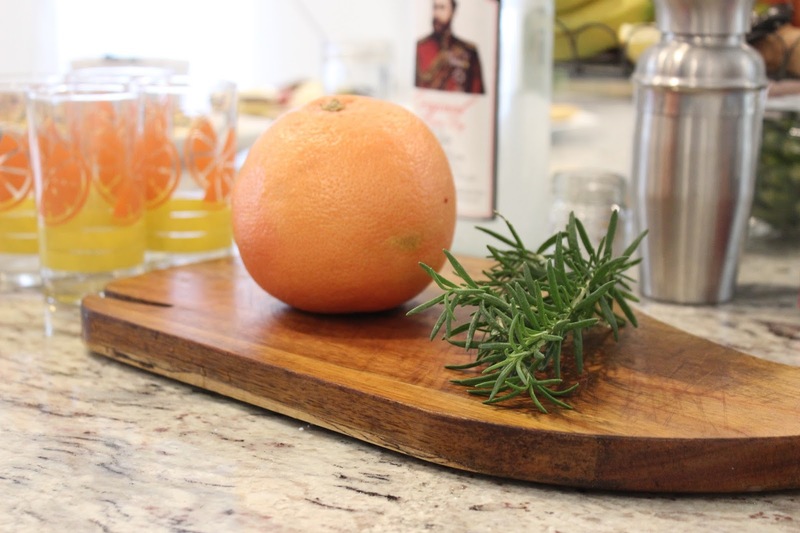 Go ahead, and take your nice platters and plate your dishes. Garnish things. Beautify your brunch. Hope this takes your fears from hosting a brunch. You can do it!! I believe in you. Hope you guys brunch it up this weekend. That's what I'll be doing again!